Peaches have been a popular fruit in the South since the Spaniards first brought them to North America. California, Georgia and South Carolina are the largest producers of peaches in the United States. Peaches can be dried, canned, made into jams, jellies, and preserves, used as filling for desserts, and used as an ingredient in many other dishes, from appetizers to entrees. When shopping for peaches, choose fragrant fruits which are unblemished and not overly firm. Because fresh peaches are highly perishable, don't buy more than you plan to use. Even when unripe, they spoil easily. Peaches that are greenish colored were probably picked too early should be avoided. Sweetness does not increase after picking, so ripe-picked fruit is always the tastiest. Peaches will peel more easily if blanched for a minute in boiling water then plunged in cold water for a minute to stop the effect of the heat. Peaches discolor quickly when exposed to the air, so should be sprinkled with lemon or lime juice, or a fruit "keeper" if not eaten or cooked immediately. This is the perfect cake to take along to the office or a morning meeting. This pound cake will be an instant hit! Serve the cake with whipped cream or dust it with powdered sugar. It would be excellent with a simple peach sauce or strawberry sauce. Canned peaches make this a super easy dessert. Serve peach crisp warm with a scoop of ice cream. 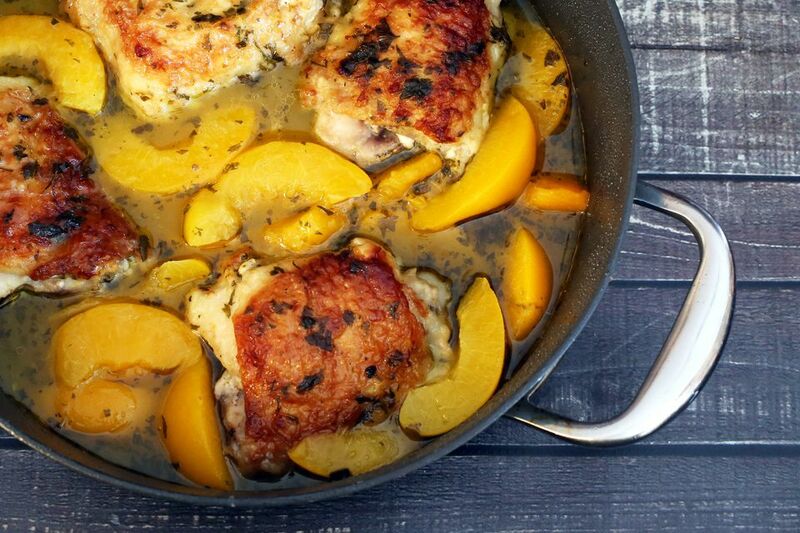 This baked chicken with peaches makes a tasty family meal for any night of the week. The tangy orange and honey sauce combined with the peaches and lightly fried chicken is surprisingly tasty and a very easy preparation. This old fashioned cobbler is made with a fresh peach filling. The topping is made with pastry strips. This easy sauce is made with canned peaches and peach brandy or nectar. Add some berries to the sauce. This dump cake is made with fresh or frozen peaches and a cake mix. A cake mix makes this upside down peach cake a snap to prepare. It's made with canned peaches. This peach cobbler is made with a filling of canned peaches. The cobbler is topped with a biscuit dough topping. Spoon these spiced peach preserves on biscuits or English muffins for a real treat. Or warm them a bit and spoon over ice cream. Peach dumplings make a delicious dessert with a drizzling of cream or whipped topping. The biscuit-like dumplings are cooked atop the simmering fruit. It's an excellent alternative to a baked cobbler. This fruit salad is made with fresh chopped peaches, strawberries, bananas, and grapes. The dressing is a simple pineapple juice and ginger combination. This simple peach cobbler is topped with an easy rolled cream and butter pastry crust. This easy fruit crisp is made with fresh peaches and a simple spiced crumble topping. The flavors of peach cobbler come through in this moist and delicious peach quick bread. A crunchy crumb topping is the perfect finishing touch for this baked peach crumble. Serve it warm with a scoop of ice cream. This peach bread is a tribute to Georgia peaches! The quick bread is filled with pureed peaches and chopped nuts. This amazing pie is made with layers of fresh sliced peaches and an easy peach glaze. These simple baked chicken breasts are glazed with a mixture of peach preserves, herbs, and spicy mustard. A delicious spiced crumble tops this fresh peach pie. The pie shell is baked and filled and then finished in the microwave to cook the topping. These delightful little cheesecakes are easy to fix and make a delicious dessert or snack. It's a great party dessert, too. Fresh is best, but if you can't find fresh peaches in season, make the cobbler with frozen (thawed) peach slices or canned and drained slices. Top this warm peach bread pudding with caramel sauce or butterscotch sauce. 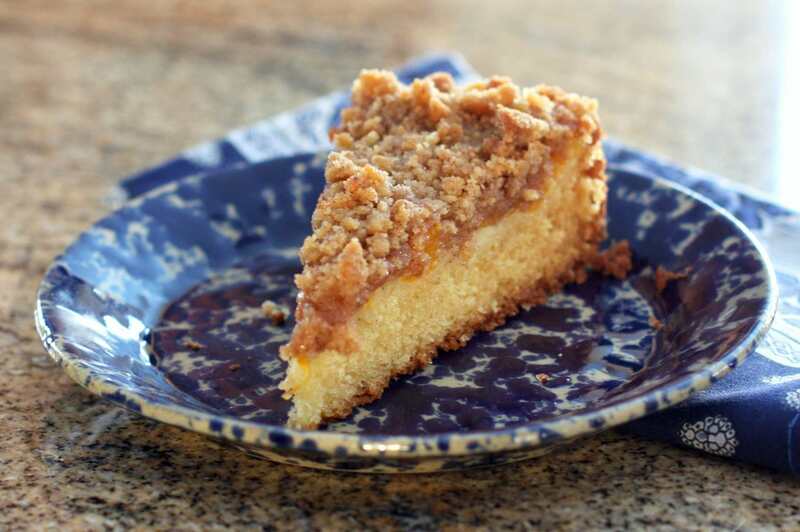 This rich coffee cake is made with fresh peaches and a brown sugar crumb topping. This peach pie is filled with a thickened mixture of peaches and sweet cream. Plan to make this flavorful fresh peach salsa early in the day or the day before to give the chopped fruit and vegetables time to mingle. Fresh peaches and peach nectar flavor this fabulous peach bread pudding dessert. Save your summer peaches and enjoy them year-round with this easy peach freezer jam. This peach (or nectarine) marmalade is a breeze to make with fruit pectin. Peaches, tomato, green onion, red bell pepper, lime juice, and seasonings team up in this tasty salsa. Add a little sugar or honey for a sweet salsa. Whirl your fresh peaches in a blender with some milk, ice cream, and pineapple juice for an incredible shake. Fresh sweetened peaches and whipped cream provide the filling for these baked biscuit layers. This simple peach upside down cake is made with canned peaches, but fresh or frozen peaches could be used as well. This cake is like an upside-down peach cobbler with a cream cheese topping. These simple poached peaches are wonderful on their own or serve them over cake or ice cream. This peach cobbler has long been a popular way to make a cobbler quickly. This version is made with canned sliced peaches, and it's perfect for when you don't have time to peel and pit several peaches. Or when peaches aren't in season. The biscuits are super easy to make with refrigerated biscuits, canned peaches, and a little coconut. Just bake them in muffin cups and you have a fabulous dessert! Peach and Coconut Upside-Down Cake, best served warm, with or without a scoop of vanilla ice cream, and expect plenty of "oohs" and "aahs." Baby back ribs or spareribs are baked and glazed with a tasty peach barbecue sauce. Serve these ribs with baked or mashed potatoes, baked beans, and coleslaw or a tossed salad. Capture the sweet flavors of summer with this fabulous peach raspberry jam. The pork is marinated in a fresh and delicious peach puree mixture. The marinade is boiled and then used to baste the rotisserie roast. Use canned or frozen peaches to make this delicious chicken recipe. This upside-down fruit cocktail cake is a spongy, relatively light cake with a fruity topping. Use canned fruit cocktail or chop an assortment of fruits separately. Peaches would be an excellent choice. A simple, two-ingredient glaze makes this baked ham a snap to prepare and bake, and the contrast of the sweet glaze with the salty ham is classic.